When moist wind hits a mountain, it is forced to rise. Rising air expands due to lower pressure and this expanding air cools, allowing the moisture to condense into snow. This process is called orographic lift and is responsible for creating more than half of the snow that falls for the resorts on larger mountains. Let’s take a look at the mountain ranges in New England, how these ranges create their own weather and where you can find the highest snow totals. The climate of New England is an interesting mix of continental storms and maritime storms. When systems come from the west, they bring some moisture and cold air, which creates respectable totals of light, fluffy snow. When systems come from the southwest or up the coastline, they draw in plentiful moisture from the Gulf of Mexico and from the Atlantic Ocean. This maritime influence can lead to very large snow totals, but also means that the snow is often (not always) a bit heavier and thicker since the air is often (not always) warmer than with storms moving in from the west. The mountain ranges of New England are spread out across hundreds of miles. This usually means that at least one area is in a good position for whatever type of storm moves into the region. There are four major mountain ranges in the region. In the southern part of New York are the Catskills, which rise abruptly from 200 feet in elevation near the Hudson River to over 4,000 feet at Slide Mountain. The two main ski areas of Hunter and Windham are on the northern end of the Catskills. This region offers good snow and challenging skiing close to New York City, however their more southern location means that some storms can bring warm air and rain into the area while locations further north stay all snow. Up I-87 in New York are the Adirondacks, which rise to over 5,000 feet in elevation. Since these mountains are further north and are some of the highest in the Northeast, cold air makes snow a good bet for most storms. 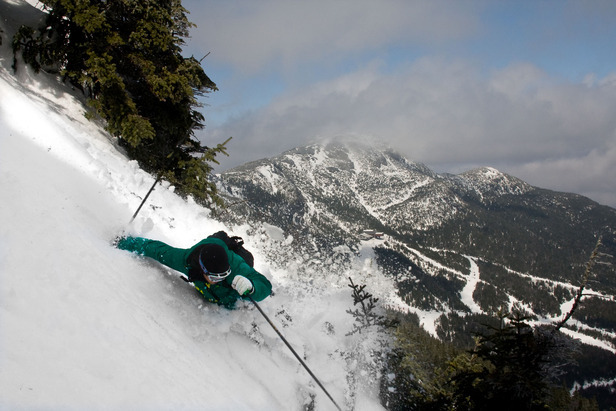 Whiteface ski area is the furthest north and is located close to the town of Lake Placid, which was home to the 1980 Winter Olympics. Stretching the length of Vermont are the Green mountains, which extend from the Canadian border all the way south into Massachusetts. The highest mountain in this range is Mt. Mansfield, where the northern Vermont resorts of Stowe and Smugglers' Notch are located. This entire range sees the best snow with moist winds from the northwest, which rise quickly from the lowlands around Lake Champlain to the 4,000-foot mountain summits. The highest peak in New England is not in the Catskills, Adirondacks or Green Mountains. Instead, the White Mountains of New Hampshire are home to Mt. Washington, which rises to 6,288 feet. The numerous resorts in this region are in a prime position to see snowfall from two different types of storms. Systems that come in from the west provide most of New England with good snow including the Whites, but systems that move up the coast—commonly known as Nor’ Easters—tend to produce the deepest snow. Since the White Mountains of New Hampshire and Maine are only about 50-75 miles from the coast, they are close enough to the storms to see good moisture but far enough from the warm air near the coast to stay all snow. 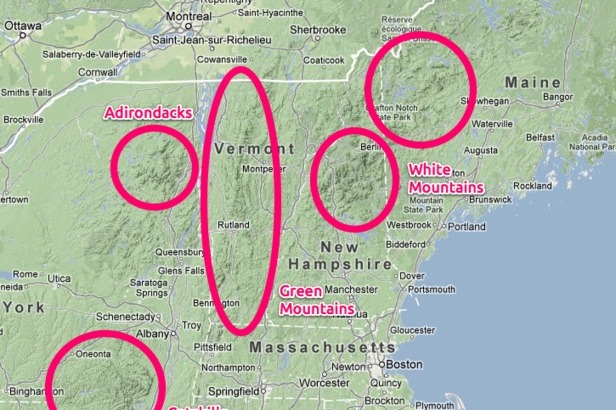 New England may have smaller mountains than the western US, but don’t let this fool you. Some northern New England resorts see as much or more seasonal snowfall than their counterparts west of the Mississippi, and it’s all thanks to the varied storm tracks that bring snow from many different directions.